The TS connector series has a mechanism of terminal position assurance. This series consists of 0.64mm, 1.5mm, 2.3mm, 4.8mm and 8.0mm types classified according to terminal size, covering an extensive array of applications from signal to power circuits. -Retainers are pre-mounted on connector housings, and are structured to enable setting by the same simple operation regardless of the number of ways, improving operability. 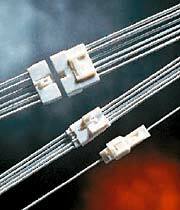 -These connectors can be directly secured to a support on the car body. -PCB models are also available for connection to printed circuit boards.